In a little less than two weeks my family and I will be enjoying a long weekend on the Yucatan Peninsula of Mexico. While June is not the best time of year to get huge numbers of neotropical migrants it did work out perfectly for us in terms of when we could go and find a really good deal to take advantage of. A three-day weekend is not nearly long enough to really delve into all of the Yucatan Peninsula’s amazing endemics but I do hope to pick up a few and part of the criteria for the resort we chose had to do with if there was habitat that looked decent for birding. Having never birded in Mexico at all I was initially concerned about identifying the myriad species that can be seen. But my experiences in Belize and Honduras give me a good basis in the birds of the region and I have plenty of time to study and learn what to expect with the endemics. But rather than just use field guides for visual field marks and xeno-canto for sounds I have discovered a fun way to help me prepare that also contributes to citizen science in a small but noticeable way. 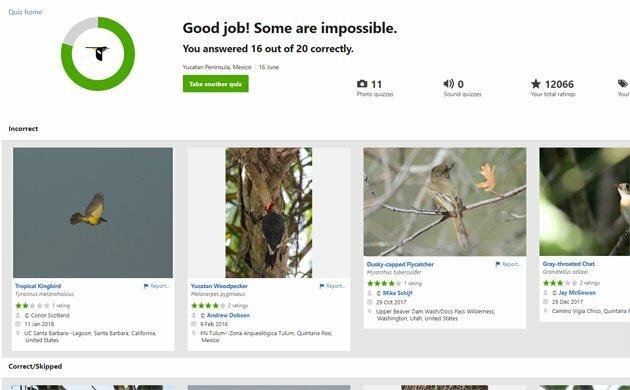 I’m using the relatively new quiz feature on eBird! The concept is simple. You pick a region and date and if you want to do a sound or photo quiz. 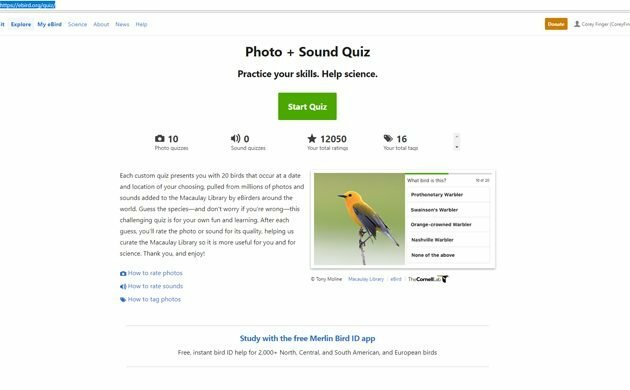 Then you go through twenty examples, choosing one of four options for each item to identify the bird in the image or sound clip. (You can also select “None of the above” and this answer is correct surprisingly often.) Then you learn if you got the answer right or wrong and, this is important, you rate the photo or sound clip before you get the next quiz. You can also “tag” the photo with additional information, like if the bird is in the hand or if there is a watermark added by the photographer. It’s fun, surprisingly addictive, and helpful to eBird in that you are helping to rate the millions of data points eBird users have loaded onto their servers. The quizzes not only help you figure out what birds you need to study because you get them wrong but also give you a good idea as to what birds to expect on your travels. I’ve realized that if I am going to see and identify a Yucatan Flycatcher I had better study Dusky-capped Flycatcher and Brown-crested Flycatcher. Those Myiarchus flycatchers can be a real pain. So far the best I have done is seventeen out of twenty. Must. Keep. Practicing. I find that the photo quizzes are most useful when you use a field guide to review your wrong answers at the end of the quiz so you can figure out what you did wrong and learn the field marks for the next quiz. Hopefully, I’ll do better than 85% correct when I’m in Mexico. But if you start seeing some sketchy eBird reports in mid-June from the Yucatan Peninsula you’ll know why! Once I start regularly getting at least 90% correct I’ll move onto the sound quizzes. Wish me luck, both on the quizzes and when I get to Mexico!